Usually I use some activities, which help to awake everyone in the room and make their brains work a bit. 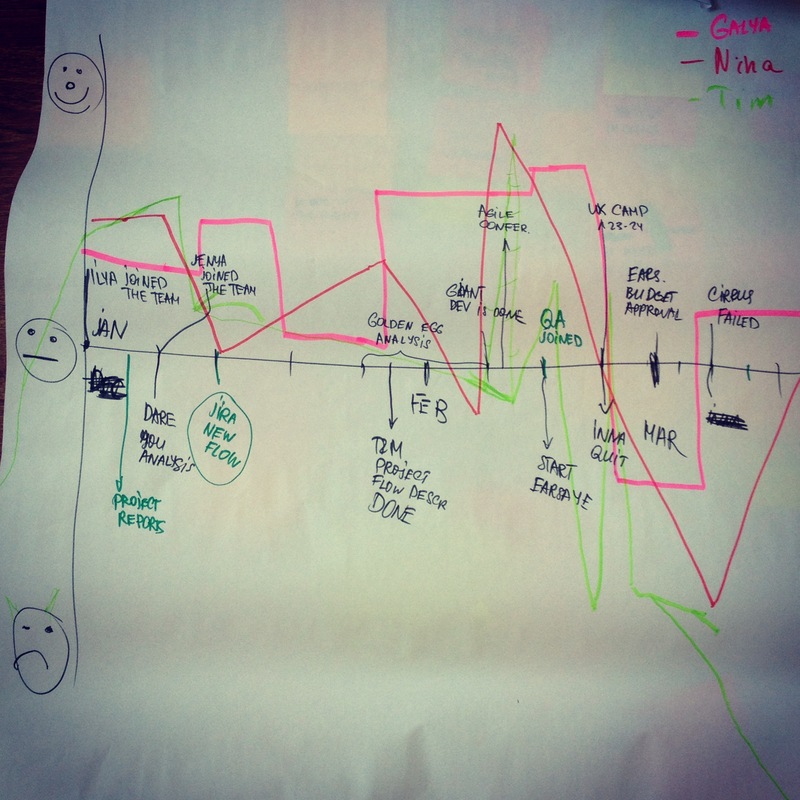 Some time ago I came across the idea to visualize the team mood during the sprint. The idea is to show “what happened during the sprint” and the team members mood connected/not connected to these events. You will need: board/flip chart, markers, team. 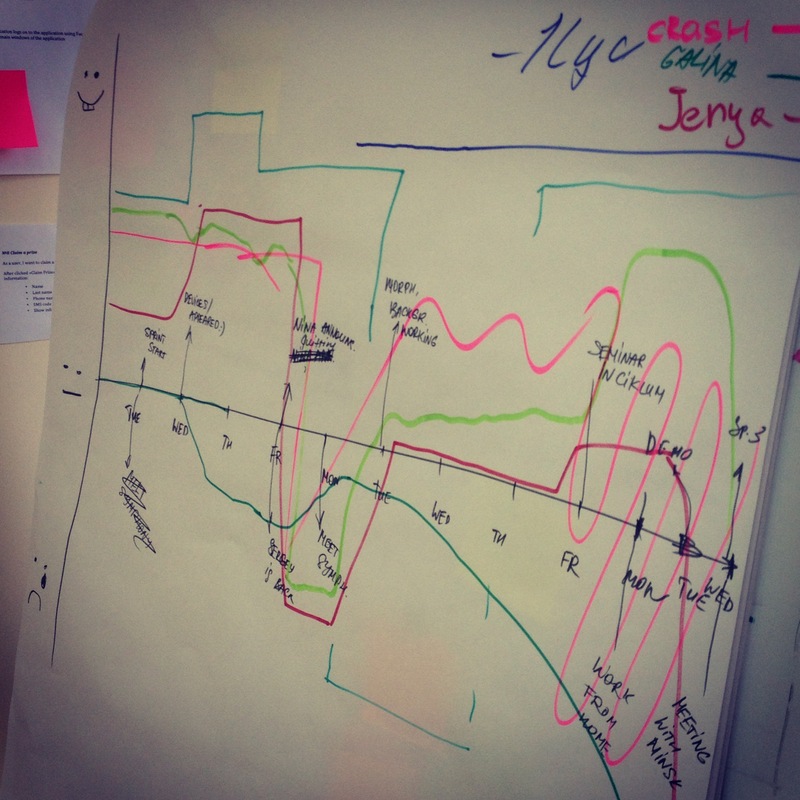 PM/Scrum master draws two axis – the horizontal one shows the “time”, vertical one is for “mood”. Time axis should have all your sprint days marked. PM puts all the sprint events, which matter to the team. After that it is time to have some physical activity – all the team members get up and join PM near the board. They have to draw their mood every day of the sprint. Events on the line help a lot when it comes to remembering what we were doing at that day. As you can see the mood can differ a lot and can be very unstable. 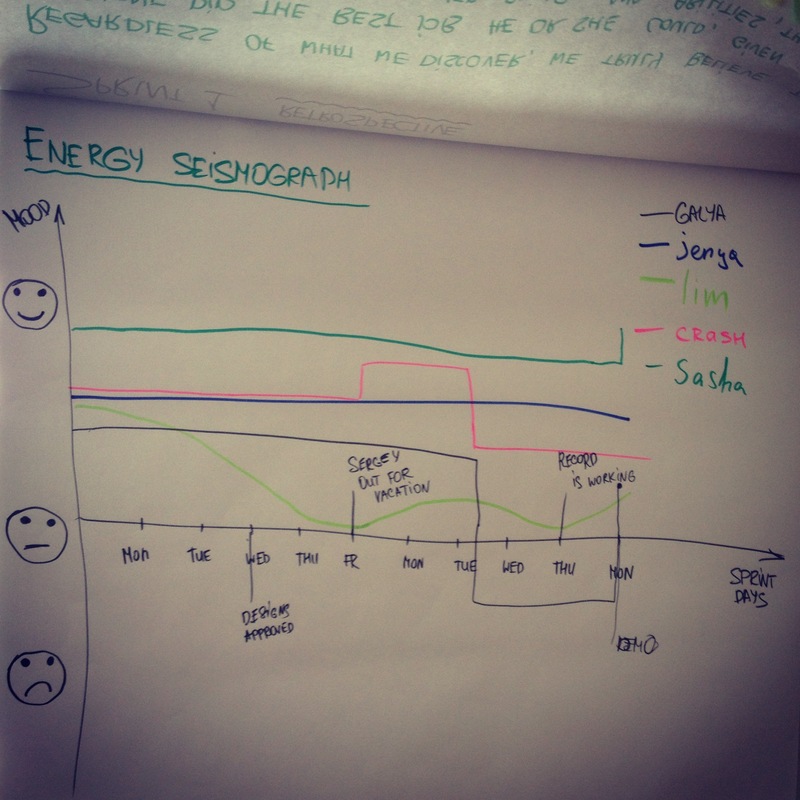 This graph shows the mood of the team when we had a big big changes in the company. Note: Don’t ask developers drawing their mood one by one when all the rest of the team is looking at them. It is very hard to show your real bad mood on the graph, especially if others were optimistic. Yarrr, you did the hardest thing! All of you had to get up and draw something, argue about who will get the pink marker. Now it is time to discuss the result. I bet you’ll se the interesting things on the graph. For example, if your team was honest enough – you’ll see that they were not so happy, as you thought. Great! it’s time to discuss, why and what do they think about all this stuff. Now it is time to turn to the retrospective. You had a great push to discuss the events, remember, what you did during the sprint. This can be the first part of the retrospective. The resulting graph should be located in the team’s room. I bet everyone who enters the room will ask “What is this? I want this for our team too!”. Just imagine, how hard it is to answer the question ‘How was your mood during the sprint?”. 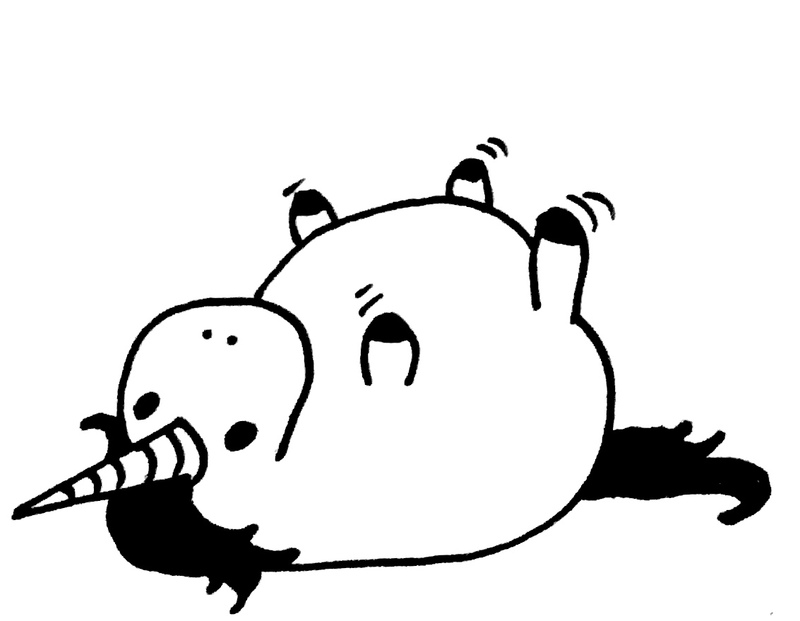 You’ll probable hear “Everything was ok”. Especially, if the management is present on the meeting. In our company we have regular PM meetings, where our bosses can be present. PMs are expected to tell about the issues on their projects, teams, etc. Can you imagine PM standing up and saying “Everything is worther than I expected, I failed, team failed…”. This PM will probable found himself in the list of whiners and a defeatists. And the example of the positive graph, so you won’t thing it’s a disaster on all my projects. Everything is great? But why PM is so nervous? Let’s discuss that!